El Niño and La Niña are both prominent phases of the larger pattern known as the El Niño Southern Oscillation (ENSO). 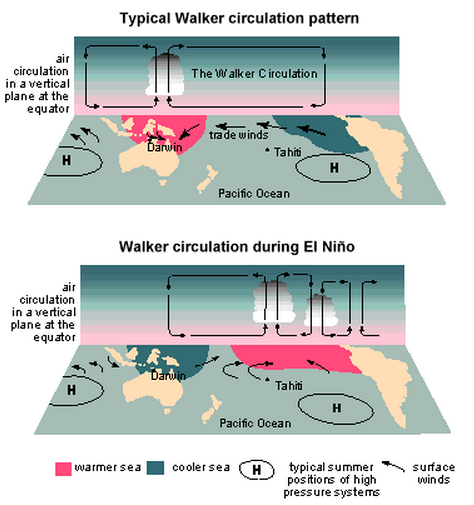 Additionally, the phase of ENSO (an ocean oscillation) is strongly tied to a specific atmospheric pattern known as the Walker Circulation. Normally, trade winds across the tropics blow in a counterclockwise pattern and results in easterly winds across equatorial regions. This circulation has two main impacts: The first is to transport warmer, tropical waters across the central and western Pacific Ocean. The second increases upwelling of cooler water off the South American Coast and Eastern Pacific Ocean. This results in a circulation pattern that promotes increased ocean temperatures, cloud cover and precipitation across the Western Pacific Ocean and most of Indonesia. Conversely, cooler ocean temperatures, associated with high pressure and drier weather, are typically found across the Eastern Pacific (see the top part of diagram below). During La Niña, this pattern is enhanced…resulting in stronger easterly trade winds, more upwelling (of cool water) off the coast of South America and a pronounced increase in sea surface temperatures across the Western Pacific Ocean. 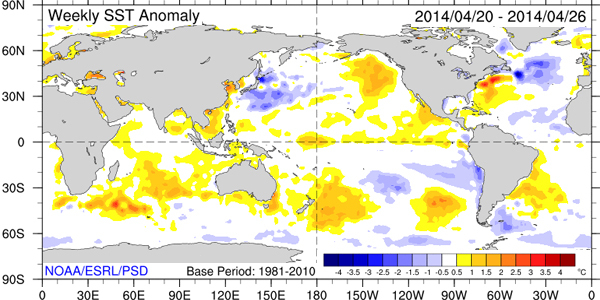 During El Niño, the opposite occurs, and the trade wind pattern either weakens considerably or is even reversed. As a result, warmer than average water temperatures are usually found off the South American Coast and across the Eastern Pacific in general. Similarly, warmer water is transported away from the West Pacific, which results in cooler ocean temperatures across Indonesia (see bottom part of previous diagram). Because ocean temperature departures are the main impact of this circulation, the strength of ENSO depends upon the sea surface temperature anomalies (departures from average) for various regions across the Pacific Ocean. The attached diagram below shows the four main regions for which temperature anomalies are calculated. 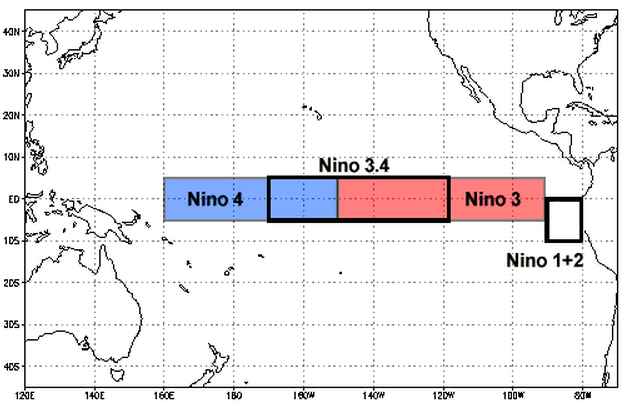 Although all of these regions are important to some degree, years of research has shown that departures across region 3.4 (outlined in the black box) are most important when calculating the phase and strength of ENSO. Generally speaking, La Niña conditions correspond to at least five consecutive months averaging temperatures less than -0.5°C. Conversely, El Niño conditions correspond to readings averaging at or greater than +0.5° over the same time period. Note that the further removed the sea surface temperature is from its average position will result in an increasingly strong El Niño or La Niña. For instance, a departure of just +0.6° would indicate a weak El Niño, whereas a departure of +1.8° would correspond to a strong El Niño. Similarly, a departure of -0.6° would be indicate of a weak La Niña, whereas an anomaly of -1.8° would correspond to a strong La Niña.